This is a beautiful one owner, low mileage, no pets, no smoking, stored inside when not in use coach in immaculate condition throughout. 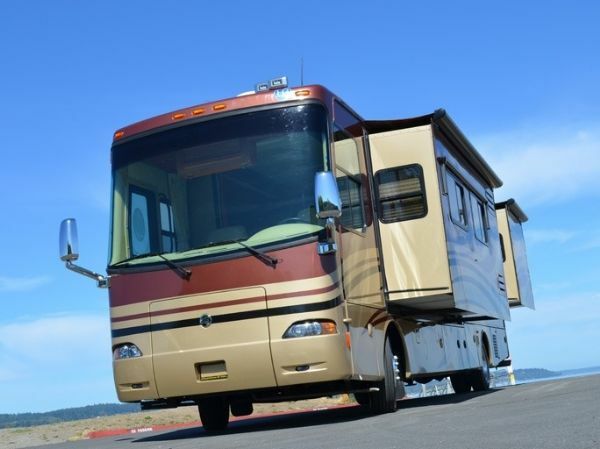 The spectacular full body paint scheme is in flawless condition and will command attention wherever your RV adventures take you. This is a highly optioned unit including beautiful cherry cabinets, select comfort king bed, 3 camera rear vision system, deluxe Dometic side by side refrigerator, central vacuum system, LCD TV's front and rear, full tile floor from entry to bedroom, power cord reel, power water reel, Sanicon drainage system, auto gen start, bedroom ceiling fan and Aladdin system just to mention a few.The Holiday Rambler Endeavor is constructed on Monaco's top of the line Roadmaster RR8R Series chassis that features 10 air bags to provide a silky sooth air cushion ride. The air bags are located on the outside of the chassis rails to provide more stability when cornering or in windy conditions. The powerful Cummins 400-HP ISL turbo diesel engine produces a whopping 1,200 LB-FT torque that will propel you over the mountains with your car in tow! The super sooth and reliable Allison 6-speed automatic transmission transfers the power and torque of this engine to the drive axel. The 8KW Onan diesel generator will provide all the power you need to operate everything in the coach when shore power is not available.